This Microtech Kestrel was my first Microtech, and I remember being very excited when I was waiting for it to arrive. This was many years ago when Microtech was not nearly as big as it is now, and the company was still respected by the majority of the people in the knife world. 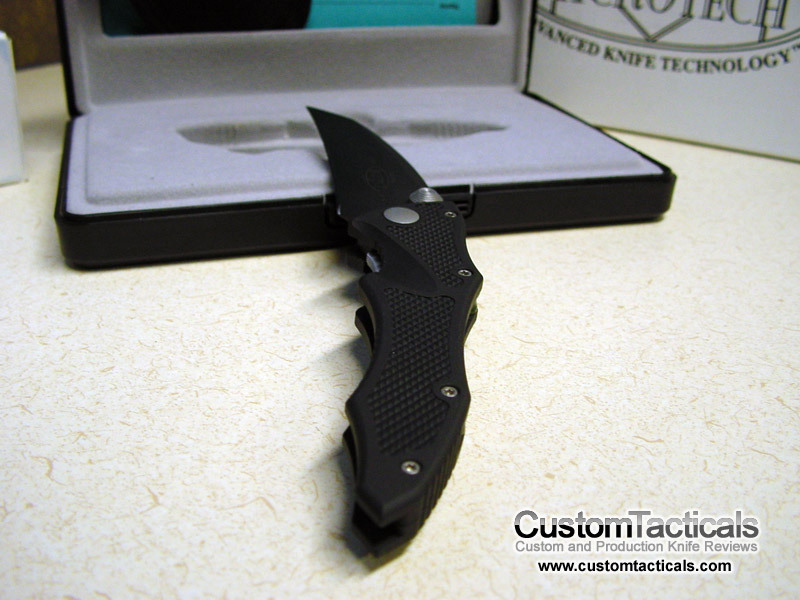 I ordered it online sight unseen like I do most of my knives… and when it came I was blown away by the quality! The annodized handles have this soft feeling to them that was fairly unique to Microtech at the time, with fit and finish that was among the best I had ever seen. The handle was precisely machined and beveled in all the right placed, and the lock bar was a peice of Titanium that was hinged within the aluminum handles, and spring-loaded so that a spring pushed it into place when the knife opens. A unique approach to the locking liner concept, and in my opinion quite good. 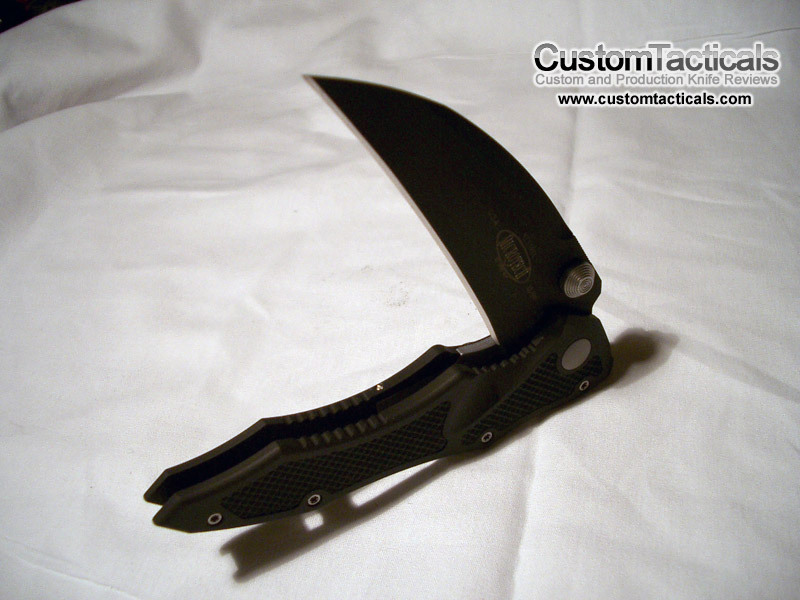 Blade steel is the unbiquitous 154CM, black coated and razor sharp. The hawksbill style blade makes the Microtech Kestrel a bit less versatile than drop point or clip point blades, but is still great for opening mail or boxes. There are many details about this knife that are now fairly common, that at the time made the knife stand out. The perfectly countersunk allen head screws, the large beautifully machined thumbstud, fairly complex inlaid kraton rubber inserts, machined fine grooves in the lock back: all of these things lend to the incredibly polished and confident style that makes a Microtech. The Kestrel fits my hand like a glove, but my hands to lean towards the smaller side, so larger handes will definitely find this knife on the small side. To be honest, aside from the very cool styling, the Microtech Kestrel isn’t a knife i could see myself carrying, and I never carry it really. The backside of the knife is devoid from any details, aside from a pocket clip. The clip is not reversible. I would have liked to see an additional Kraton rubber insert on the back. Like all Microtechs, this knife is finished with the same perfection and attention to detail that you will be used to, and will be a nice surprise if it is your first. If you are looking for an EDC, you may want to check elsewhere, but this is a very finely finished knife either way. the kestrel was also my first microtech. mine has green anodized spacers, (my fav. color) and has a satin finished blade. i love this knife! fit and finish is outstanding, one of the sharpest knives i own!